Martello was the 19th century term for a small fort and West Martello Tower was built during the Civil War as an adjunct to the larger Fort Zachary Taylor, a few blocks to the west. It was used for various purposes — often to house soldiers and supplies — until the end of WWII, when it was given to the local government. 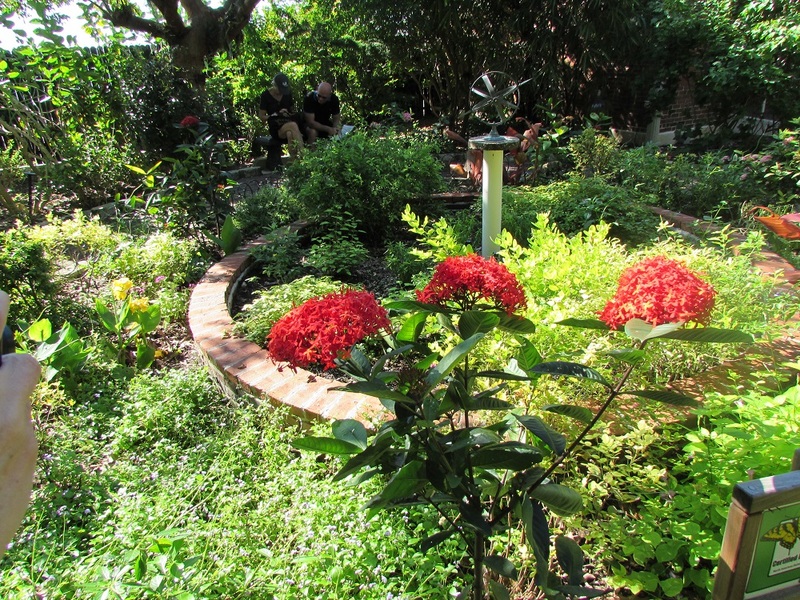 It decayed under the government’s watch but in 1949, the Key West Garden Club took it over and turned it into an urban oasis. We were ready for an oasis by the time we got to the Key West Garden Club gardens in mid-afternoon. The temperature and humidity had hit the high 80s and the massive trees and tropical plants provided a swath of shade. There were restrooms, a water fountain and a small art gallery. Also a butterfly garden. And the remarkable thing about all of this: admission was free (so you should not confuse it with the Key West Tropical Forest and Botanical Gardens, which is a more commercial venture). The gardens were small, but with enough room for some lovely nooks and hidey holes. People sat on the chairs and benches dotting the gardens, reading books or otherwise occupied in a way that made us think that the gardens were a regular hang-out spot for locals. If I lived around there, it’s where I’d hang out too. But did I let poor Patricia sit and hang out for awhile? Of course not. We had about two hours before we had to get back on the ship, so it was on to our next stop: the Ernest Hemingway House, where Hemingway had lived in the 1930s. On the way there, though, another detour. Hemingway wasn’t the only author to live on Key West. Tennessee Williams was said to have finished Streetcar Named Desire there and, with the money he made from it, he bought a small, tropical cottage downtown. That house, which he owned until his death in 1983, isn’t open to visitors, but there’s a (free) Tennessee Williams exhibit in a cute little bungalow that also houses the Key West Gay and Lesbian Community Center. Williams is one of my favorite playwrights so we took 10 minutes to fly through the one-room museum to look at their first editions, photographs and other Williams memorabilia. The Hemingway House was just around the corner from the Williams exhibit. We didn’t want to tour the Hemingway House — we’d been there before so it wasn’t a priority — but Patricia wanted to see one of his six-toed (on each foot) cats. The story goes that a sea captain gave Hemingway his first polydactyl cat and they’ve been breeding like crazy on his property ever since. The museum fell afoul of animal welfare activists over the cats (who were feral and running amok) about 15 years ago and now they (the cats, not the activists) are regulated through controlled breeding. There are about 45 of them on the property at any given time so we figured that there was a good chance that we could spot one in the yard. We figured wrong: there’s a high wall around the property and the ticket booth is at its gate. We couldn’t see the yard or the cats without paying admission so Patricia didn’t get to see a cat. By this time, it was about an hour before we had to be back on the ship. So I left Patricia to meet with a friend who had driven from Miami to see her and I went to do some souvenir shopping. It was the last stop on our cruise and I still needed to get something for Mr. History Tourist. He doesn’t mind when I go off on my girls-only trips, but he expects me to return bearing gifts. Pretty quickly, I found a sports shop with a Key West themed bicycling jersey for Mr. HT. That left me with enough time for a quick run to the Harry S. Truman Little White House, very close to the wharf. 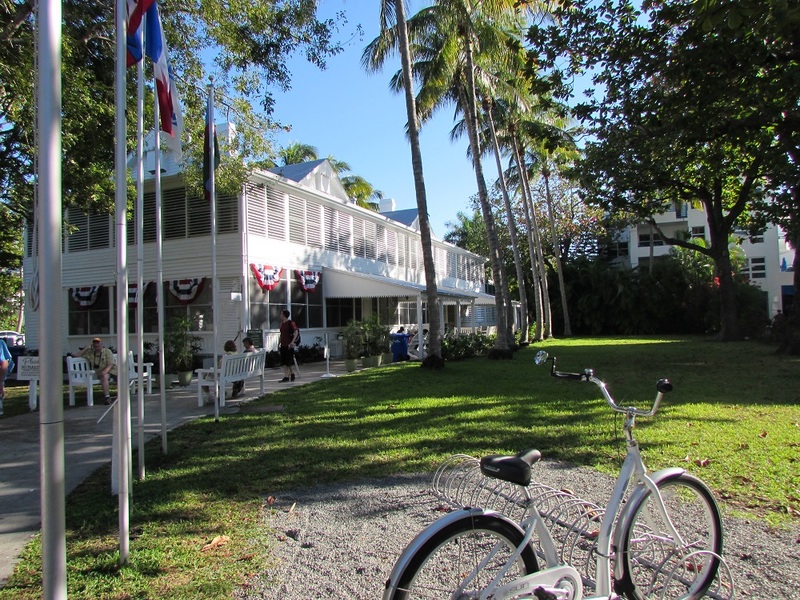 Its a circa 1890 house that started life as barracks for naval officers stationed at the Key West submarine base. Presidents Taft, Eisenhower, Kennedy, Carter and Clinton stayed there, but it’s named after Harry Truman because he used it as a regular vacation home. As with the Hemingway and Audubon houses, I’d toured it before and didn’t have time to tour it again (besides, no photos allowed inside), so I took a couple of exterior photos before running back to meet Patricia in front of the Customs House, where we’d started our day on Key West seven hours earlier. 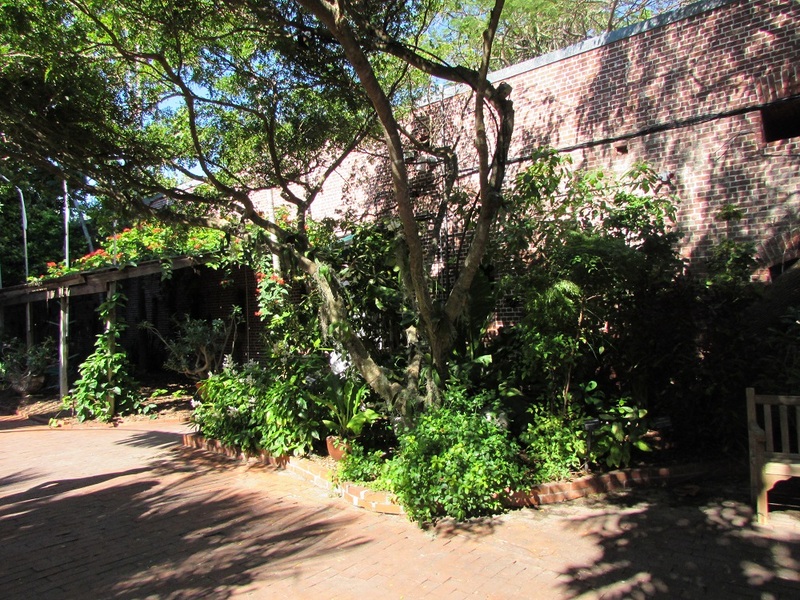 Gallery | This entry was posted in Florida and tagged Harry S. Truman Little White House, Key West Garden Club, Tennessee Williams, West Martello Tower. Bookmark the permalink. YOU are really travelling these days!!!! We had to get away from the cold and snow! I had a wonderful time as you did in Key West! When the History Tourist ran off looking for souvenirs Patricia finally got a chance to hang out and eat Key Lime pie with her friend. I’d like to give a Shout Out to the Florida Rambler blog which recommended the free gardens. I added a link to the Rambler blog in the body of the article. Next time I’m in Key West, the Key West Garden Club gardens will be a must-see. Just my cup of tea. It was so beautiful. And so unexpected.